A. The weather is generally mild all year long. June through September is mostly sunny with temperatures ranging from the mid 60's to the low 80's. Much of the cruising areas of the Pacific Northwest are in the "rain shadow" of high mountains that block many of the weather systems that come in off the Pacific Ocean. The result is that rainfall can be as little as 20 inches annually in some areas. There is even a variety of cactus that flourish on the Western slopes of certain islands. Q. 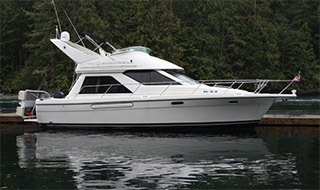 What are the qualifications and experience necessary to charter a boat? A. You do not need to hold a skipper's license or sailing permit to charter a boat from AYC. A good rule of thumb is that you need verifiable experience on a similar vessel and adequate knowledge of the cruising area. Q. What if my experience is insufficient to charter a boat? A. If your boating resume indicated insufficient experience on the vessel you have requested, we have a variety of instructional options to help you qualify. 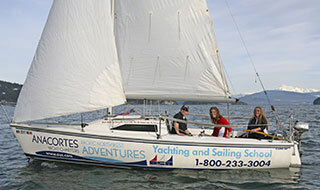 For example, Introduction to Cruising or ASA Sailing School for the novice and Cruise-N-Learn's for those who need a little bit of a refresher to bring them up to speed. 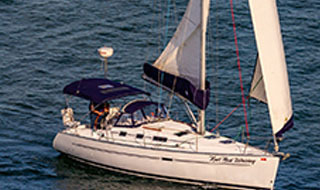 We also have friendly professional skippers, who can pilot any yacht you choose, no experience on your part necessary. Q. What are the winds like and when is the best time of year to sail? A. From May to October the winds are mostly moderate (6-18 knots). This varies by locality and time of day with the fresher breezes occurring among the island archipelagoes. Some sailors choose May through early June for their sailing charter when the weather can be brilliant and the breezes fresh. Q. What time of year should we charter? A. Each time of year brings with it its own beauty and appeal. Although July and August are the most popular many prefer May and June or September and October when the crowds are less and the boating can be terrific. June is the month with the most daylight hours. May is a time to mix world class skiing with spectacular cruising. September and October are the favorite times to visit the myriad of harbor side villages and hospitable resorts. Q. What should we bring with us? A. Depending on the time of year or your destinations, you will need suitable clothes for the season. Don't forget sunglasses and suntan lotion. 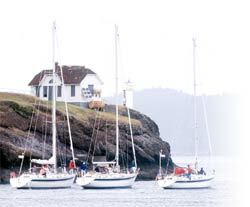 Anacortes Yacht Charters provides berth linens and towels for all charters. All you need are provisions! And should you require, we even have optional provisioning services available to you. A. Simply call or email our yacht reservation specialists. 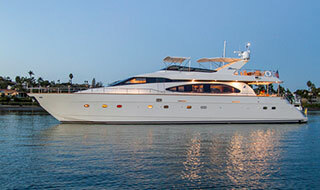 They can guide you through each step of yacht selection and available dates.